Ida M. Oetgen was born circa 1877 in North Carolina. She was the daughter of John Herman Gerhardt Oetgen and Marguerite Rebecca Katharine Meyer. Edgar Ostendorff Oetgen was also known as Eddie E. Oetgen. He was born on 17 March 1878 in South Carolina. He was the son of John Herman Gerhardt Oetgen and Marguerite Rebecca Katharine Meyer. Edgar Ostendorff Oetgen married Gracie Creech in 1906. Edgar Ostendorff Oetgen lived in 1918 in Atlanta, Fulton County, Georgia. Margaret (?) was born circa 1825 in Hanover, Germany. Lieutenant John Oetgen was born on 23 May 1921 in Georgia.1 He was the son of Herman Glenn Oetgen and Helen McCormick.1 He graduated from the Benedictine Military School. Lieutenant John Oetgen died on 7 August 1944 in Sutter County, California, at age 23 2nd Lieutenant John Oetgen, 433 Base Unit, Chico Army Airfield, California--Died in the service of his country in a mid-air collision, piloting P-63A Kingcobra #42-69130, two miles west of Sutter, CA.1 He was buried at Catholic Cemetery, Savannah, Chatham County, Georgia. Lieutenant Herman Glenn Oetgen was also known as Henry Glenn Oetgen. He was born on 3 July 1916 in Savannah, Chatham County, Georgia. He was the son of Herman Glenn Oetgen and Helen McCormick. Lieutenant Herman Glenn Oetgen married Dorothy Upshur after 1935. Served as a 1st Lieutenant, 9th Bomb Wing in the US Army Air Force during World War II. Lieutenant Herman Glenn Oetgen died on 17 December 1953 at age 37 Pilot of an Air Force B-29 that crashed at Andersen AFB, Guam. He was buried at Arlington National Cemetery, Arlington, Arlington County, Virginia. 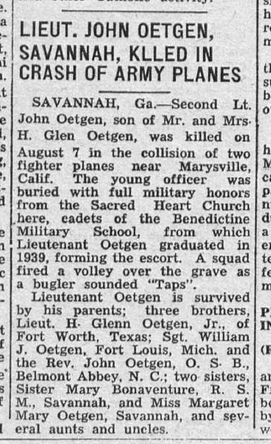 Sergeant William J. Oetgen is the son of Herman Glenn Oetgen and Helen McCormick. Helen M. Oetgen is the daughter of Herman Glenn Oetgen and Helen McCormick. BELMONT - Father John Oetgen, O.S.B., a monk and priest of Belmont Abbey, died Oct. 10, 2009. He was born in Savannah, Georgia, on Aug. 6, 1924, and attended Benedictine Military School. He entered the monastery at Belmont Abbey, where he professed his vows on Feb. 14, 1944. He was ordained to the priesthood at Sacred Heart Church, Savannah, on June 1, 1951. Father John earned degrees from Belmont Abbey College, Saint Benedict's College, Atchison, KS, the Pontifical Lateran University in Rome, and pur-sued further studies at Oxford University and the University of North Carolina. He filled important posts in both the monastery and college at Belmont Abbey. He was a Professor of English and Director of the Abbey Players, and served as President of Belmont Abbey College from 1960 to 1964. He was awarded an honorary doctoral degree by Belmont Abbey College in 2006. Father John is survived by the monks of Belmont Abbey, by his sister, Sister Pauline Oetgen, C.S.J., of Valdosta, GA, and by his niece and three neph-ews and their spouses. Father John's body will be received in the basilica at Belmont Abbey on Monday evening at 7:00 p.m. The funeral will be celebrated Tuesday at 10:00 a.m., with interment following in the abbey cemetery. He was buried at Belmont Abbey Cemetery, Belmont, Gaston County, North Carolina. Margaret Mary Oetgen is the daughter of Herman Glenn Oetgen and Helen McCormick. Elizabeth Savage was born after 1829 in South Carolina. As of 1845,her married name was Bagwell. She married Kennedy Canida Bagwell, son of William Hitch Bagwell and Elizabeth Wallace Rowe, in 1845. Elizabeth Savage and Kennedy Canida Bagwell lived in 1850 in Eastern Subdivision, Anderson County, South Carolina. Elizabeth Savage and Kennedy Canida Bagwell lived in 1860 in Watters, Floyd County, Georgia. Elizabeth Savage died after 1865 in Georgia. She and Kennedy Canida Bagwell lived in 1870 in Militia District 824, Murray County, Georgia. Mary "Jane" Bagwell was born in 1846. She was the daughter of Kennedy Canida Bagwell and Elizabeth Savage. As of 5 June 1870,her married name was Gladden. Mary "Jane" Bagwell married Samuel Gladden on 5 June 1870 at Murray, Georgia. Samuel Gladden married Mary "Jane" Bagwell, daughter of Kennedy Canida Bagwell and Elizabeth Savage, on 5 June 1870 at Murray, Georgia. Margaret Bagwell was born in 1848. She was the daughter of Kennedy Canida Bagwell and Elizabeth Savage. James Bagwell was born on 12 June 1850. He was the son of Kennedy Canida Bagwell and Elizabeth Savage. James Bagwell married Mae Hulda before 1882. James Bagwell died on 25 January 1922 at age 71. He was buried at Brannon Perryman, Haralson County, Georgia. William Chester Bagwell was born on 5 December 1852 in South Carolina. He was the son of Kennedy Canida Bagwell and Elizabeth Savage. William Chester Bagwell married Susan Katherine Faulkenberry on 28 March 1881 at Marion, Arkansas. William Chester Bagwell died on 6 June 1943 in Olney, Young County, Texas, at age 90. Susan Katherine Faulkenberry was born on 2 April 1860 in Yelville, Marion County, Arkansas. As of 28 March 1881,her married name was Bagwell. She married William Chester Bagwell, son of Kennedy Canida Bagwell and Elizabeth Savage, on 28 March 1881 at Marion, Arkansas. Susan Katherine Faulkenberry died on 8 January 1946 in Wichita Falls, Wichita County, Texas, at age 85. Elizabeth Ann Bagwell was born on 1 January 1878 in Yelville, Marion County, Arkansas. She was the daughter of William Chester Bagwell and Susan Katherine Faulkenberry. As of after 1895,her married name was Bailey. Elizabeth Ann Bagwell married Shep Bailey after 1895. Elizabeth Ann Bagwell died on 10 January 1966 in Oklahoma City, Oklahoma, at age 88. Shep Bailey was born on 1 January 1878 in Marion County, Arkansas. He married Elizabeth Ann Bagwell, daughter of William Chester Bagwell and Susan Katherine Faulkenberry, after 1895. Lillie Day Bagwell was born on 2 October 1882 in Yelville, Marion County, Arkansas. She was the daughter of William Chester Bagwell and Susan Katherine Faulkenberry. As of after 1895,her married name was McNatt. Lillie Day Bagwell married Bob McNatt after 1895. Lillie Day Bagwell died on 9 September 1971 in Casa Grande, Pinal County, Arizona, at age 88. Bob McNatt married Lillie Day Bagwell, daughter of William Chester Bagwell and Susan Katherine Faulkenberry, after 1895. Holly Jason Bagwell was born on 13 April 1884 in Yelville, Marion County, Arkansas. He was the son of William Chester Bagwell and Susan Katherine Faulkenberry. Holly Jason Bagwell married Myrtle May Wines after 1900. Holly Jason Bagwell died on 26 April 1962 in Wichita Falls, Wichita County, Texas, at age 78. Myrtle May Wines married Holly Jason Bagwell, son of William Chester Bagwell and Susan Katherine Faulkenberry, after 1900. Janie Bagwell was born on 27 February 1885 in Marion County, Arkansas. She was the daughter of William Chester Bagwell and Susan Katherine Faulkenberry. As of after 1900,her married name was Cooper. Janie Bagwell married Domie Cooper after 1900. Janie Bagwell died on 3 November 1957 in Olney, Young County, Texas, at age 72. Domie Cooper married Janie Bagwell, daughter of William Chester Bagwell and Susan Katherine Faulkenberry, after 1900. John Jacob Bagwell was born on 25 January 1888 in Marion County, Arkansas. He was the son of William Chester Bagwell and Susan Katherine Faulkenberry. John Jacob Bagwell married Rose McDonald after 1910. John Jacob Bagwell died on 21 June 1926 in Park Springs, Wise County, Texas, at age 38. Rose McDonald was born on 9 October 1890. As of after 1910,her married name was Bagwell. She married John Jacob Bagwell, son of William Chester Bagwell and Susan Katherine Faulkenberry, after 1910. Rose McDonald died on 26 January 1974 at age 83.